Market players and policymakers breathed easy on Friday, for the first time in seven days, as the rupee staged a remarkable recovery after six straight trading sessions of weakening against the dollar. The equity market, which had recovered on Thursday, joined in and posted strong gains for the second successive day. However, the majority of market players are still keeping their fingers crossed and are fretting over how the country will fund its large current account deficit (CAD), as the US Federal Reserve is expected to begin tapering its monetary stimulus. The rupee rose 2.1 per cent on Friday, its biggest jump in nearly a year. This was aided by dollar sales by government banks on behalf of the Reserve Bank of India and by foreign investors pumping money in government papers. Though month-end dollar demand by importers continued, dollar flows resulted in a positive impact. The rupee ended at Rs 63.35 against the dollar, against Rs 64.63 on Thursday. The currency had opened the day at Rs 64.31 and during intra-day trades, touched a low of Rs 64.75 and a high of Rs 63.33. On Thursday, the rupee had touched an all-time low of Rs 65.56 against the dollar, after the minutes of a Federal Reserve meeting hinted that the US was on course to start tapering its stimulus as early as next month. The rupee has been the worst performing currency in Asia in the current financial year. 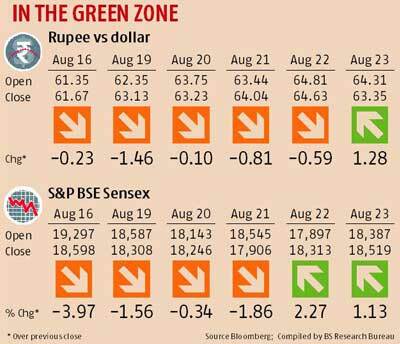 Despite Friday’s strengthening, the rupee has so far weakened about 17 per cent this financial year. The recovery in the rupee helped stock markets extend gains for the second straight day, as traders covered their bearish bets. But fund managers and brokers said the undertone was far from optimistic, as the rupee remained vulnerable to further declines amid concerns over a widening current account deficit and the rollback of the monetary stimulus by the Federal Reserve. 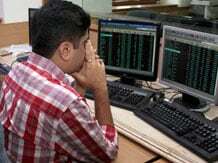 On Friday, the BSE Sensex rose 1.1 per cent, or 206 points, to close at 18,519.44. The Nifty rose 63.30 points, or 1.17 per cent, to close at 5,471.75. Beaten-down banking stocks surged on value-buying and hopes of more measures to support the economy. Foreign institutional investors (FIIs) net-sold shares worth Rs 148.57 crore, while their domestic counterparts bought for Rs 755.87 crore on Friday, according to provisional data. In August, FIIs have net-sold for Rs 3,271 crore, while domestic institutions have net-bought for Rs 4,232 crore. CRISIL also was of the view that the currency will appreciate to 60 a dollar by the end of the financial year. The rating agency said the strengthening of the rupee will come on the back of an improvement in the current account deficit front. “Foreign capital inflows are expected to pick up in the second half of the year when the steps announced by the government to attract $11 billion in capital inflows (via foreign borrowings by state-owned financial institutions and public sector oil companies and measures to attract non-resident deposits) begin to materialise,” said Dharmakirti Joshi, chief economist of CRISIL. web site as a finest website for latest updates.